1,2,&3 bedroom modern housekeeping cottages located on the sandy shores of Little Crawling Stone Lake which is part of the famous 10 lake Flambeau chain of lakes. Each cottage is well equipped and furnished to allow you to “rough” it smoothly. 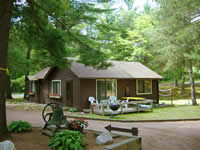 Each cottage has its own private pier right in front of the cottage and we even have our own black topped boat launch. Fishing is tops on our chain of lakes, but there is also many attractions near by such as fine dining, golf,go carts,theaters,museums,water ski shows,bike .trails,pow-wows, and of course the national forest for hiking. Here at the resort we have paddle boats, swim raft, volley ball, and lawn games. For our little guests there are swings and a sand box. Each cottage has a fire pit and picnic tables and grills.Let us help you to relax north of the “TENSION” zone and enjoy the northwoods or just sit and enjoy the crystal clear lake and all of the wildlife.